Blueberries cut the risk by 26% compared with 2% for three servings of any whole fruit - but fruit juice did not appear to have the same effect. 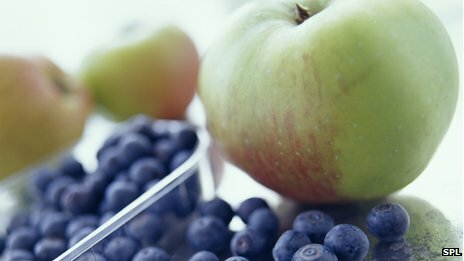 Researchers from the UK, US and Singapore used data from three large studies of nurses and health professionals in the US to examine the link between fruit consumption and the risk of contracting type-2 diabetes. The researchers' analysis of the data showed that three servings per week of blueberries, grapes and raisins, and apples and pears significantly reduced the risk of type-2 diabetes. The researchers said this could be due to the fact these fruits contain high levels of anthocyanins, which have been shown to enhance glucose uptake in mice. The same fruits contain naturally-occurring polyphenols which are known to have beneficial effects. In the study paper, they wrote: "Fruits have highly variable contents of fibre, antioxidants, other nutrients, and phytochemicals that jointly may influence the risk." But the glycaemic load of different types of fruit - the quality and quantity of carbohydrate they contain - did not fully explain the results, the study said. When they looked at the effects of fruit juice consumption, the researchers found a slightly increased risk of type-2 diabetes. The study calculated that replacing weekly fruit juice consumption with whole fruits could bring health benefits. For example, replacing fruit juice with blueberries could reduce the risk of contracting type-2 diabetes by 33%, with grapes and raisins by 19%, apples and pears by 13% - and with any combination of whole fruit by 7%. 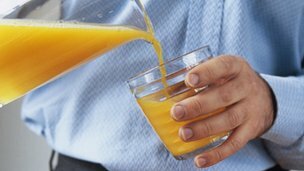 Replacing fruit juice with oranges, peaches, plums and apricots had a similar effect. Qi Sun, study author and assistant professor at Harvard School of Public Health, said, in general, fruit juices contained less of the beneficial compounds found in whole fruits. "The juicing process gets rid of the fruit, just leaving fluids which are absorbed more quickly, causing blood sugars and insulin levels to rise if they contain sugars. "To try to minimise the risk of type-2 diabetes as much as possible it is reasonable to reduce fruit juice consumption and increase consumption of whole fruits." Experts say the best way to reduce your risk of developing type-2 diabetes is to eat a balanced, healthy diet that includes a variety of fruits and vegetables and to be as physically active as possible. Dr Matthew Hobbs, head of research for Diabetes UK, said the study provided further evidence that eating plenty of whole fruit was a key part of the balanced diet that will minimise the risk of developing type-2 diabetes. However, he said the links between type-2 diabetes and specific types of fruit or fruit drinks should be treated with caution. "Some of the findings are based on a number of assumptions and models which may have distorted the results significantly. "For example, the researchers used surveys to ask participants how often they ate certain foods. This type of survey can often be unreliable as people are more likely to remember certain types of food." Kamlesh Khunti, professor of primary care diabetes and vascular medicine at the University of Leicester, said the large study showed that eating any fruit is good. "Eating all kinds of fruit works and there is still a reduction in risk. "The government recommends eating five portions of fruit and vegetables every day."